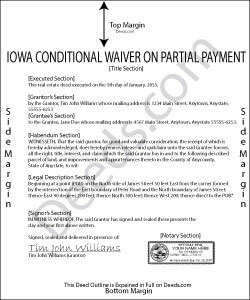 Partial waivers are used to waive a lien for up to the partial or progress payment amount. A conditional waiver means the waiver is conditioned upon the claimant receiving the amount due. Use the partial conditional waiver when the owner makes less than the full or final payment and the payment method does not guarantee receipt of the money (such as a check that hasn't cleared yet).